"Do you have any cool earrings?" This was the question asked by a young twenty something customer as she walked in the door. The young lady was trim, very put together, and probably the closest thing this part of the world has to a fashion trend setter. At that very moment, my elderly friends and I had been sitting in a corner of the gallery nursing our second cups of cappuccino discretely laced with Baileys. All three of us are racing towards our ninth decade. What do we know about "cool"? My first thought was "H--- if I know." My second thought was "Hmmm. Maybe." And then I got into gear (literally because I hustle about on a mobility scooter) and said "Let me show you what I've got." 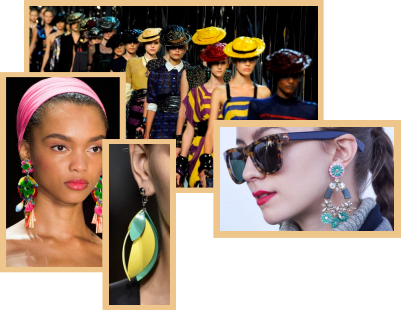 It had taken a moment before I realized that I DID know a thing or two about what was trending in the fashion world when it came to earrings. I might live in a remote and barren looking part of the Canadian Badlands and my body might be failing, but my brain still works and I like to know whats going on in the world. I don't own a television but I have digital subscriptions to The Economist, various Canadian newspapers...AND...the New York Times! It just so happened that in January I had followed the antics of the participants in New York Fashion Week and I knew a thing or two about the trends. So I was able to enlighten my new young friend about what cool earrings the fashionistas were wearing on and off the runways in The Big Apple. When it comes to women's costume jewelry the trend is towards bigger is better. But there's another kink to the tale. 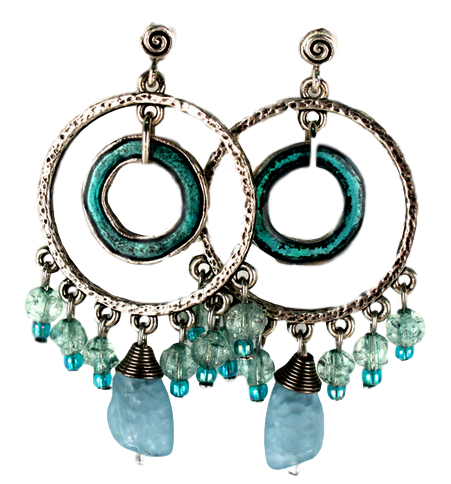 Asymmetrical, out of balance earrings were a big deal with some of the younger New York designers. On the runway it showed up in several ways. 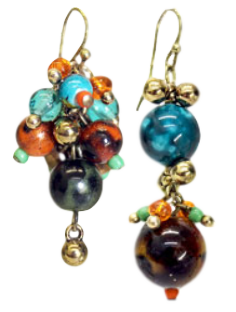 One designer featured pairs of earrings - large gold drops set with stones of mismatched colours. Another designer did something similar but the earrings were of different lengths...one was a three inch drop the other a small bauble. A third designer showcased a single HUGE earring that hung on the model's young chest. Think bright colours, feathers and many long dangly bits and you'll get the idea. It was at this point that I made the sale. It so happened that I had two earrings set aside because they'd lost their partners. They were chunky, dangly types that fit right into this year's definition of what's fashionable. The earrings were also part of the same "collection" so colours were the same but each was assembled from similar, but not identical beads. I explained the New York connection and showed them to my young customer. She was thrilled and I found a home for my mismatched pair of cool earrings. My friends and I celebrated with a third cappuccino spiked with Baileys. Here's some more funky earrings.